So glad it’s Friday! I was extra busy this week at work, so it was a nice treat to end my Friday by picking up a fantastic variety of veggies from Basket of Life Farm this evening. Let’s see if I can list everything: eggplants (3! ), zucchini, cucumber, green beans, white onion, red onion, garlic, jalepenos, lettuce, patty pan squash, green peppers, cherry tomotoes, regular tomatoes. Whew! I think I got it all. 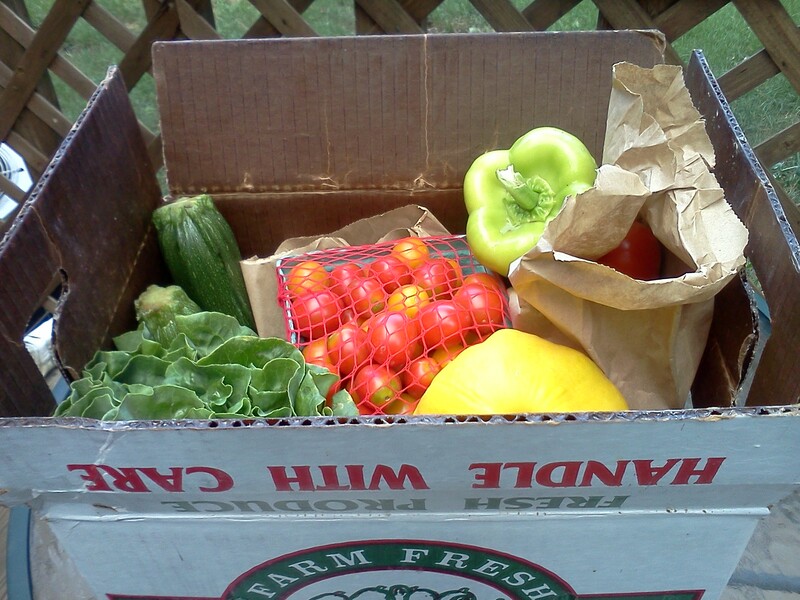 For fun this week, I decided to take a picture of the box before I take all the vegetable goodness out to show it off. I still can’t believe how full the boxes are! I started with brown rice, some leftover steak that I had grilled with a chili lime rub, a random onion that I sliced thick and tossed on the grill, and added some fresh salsa that I had made earlier in the week (CSA tomatoes, onions, green pepper and jalepenos, as well as cilantro, lime juice, olive oil salt and fresh ground pepper). I also topped it with some shredded cheese and sour cream. I’m not a big fan of leftovers, so transforming them in some way like this is really the only way I’ll make sure to use them up. I’m trying a new bread recipe tonight, so if it works out I’ll have something else to post about soon. Have a fantastic evening, everyone! This entry was posted in General on August 10, 2012 by Melissa. Your box is so full and lovely, Melissa! I can see how you really have to be thoughtful in order to use it all up! Good thinking on the leftovers. Kim is famous for piling everything leftover and placing it on a flour tortilla, then topping it with grated cheese and heating it up until it melts. Always good, too! Sounds like Uncle Kim and I agree on what to do with leftovers! Come and link up to this week’s party when your get a chance…http://inherchucks.com/2012/08/08/whats-in-the-box-38/. Looking forward to seeing you there! Linked up! Yeah, I love the different colors of peppers. Last week I got one that was almost purple! 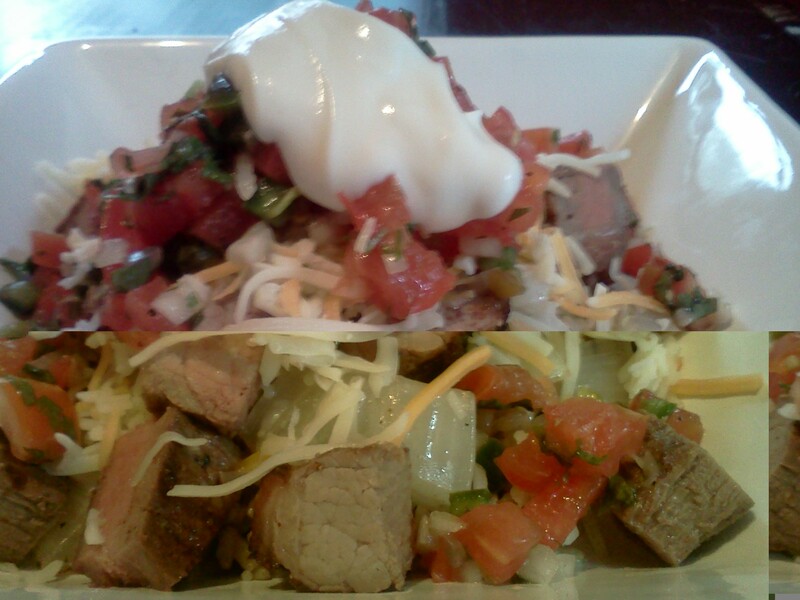 That was a great way to use your leftovers. Your Dad and I are not big fans of leftovers either, so you come by that honestly. That is where the grands come in! Your basket looks tasty once again! I try to use all my leftovers, but sometimes it’s tough! That’s when I miss having roommates to eat the extra food I cook!